زرین کمر, رقیه, غربانی, پروین. (1395). مطالعه جذب سطحی حذف رنگزای مالاخیت سبز با استفاده از گاما آلومینای عامل‌دار شده. مجله آب و فاضلاب, 27(6), 33-41. رقیه زرین کمر; پروین غربانی. "مطالعه جذب سطحی حذف رنگزای مالاخیت سبز با استفاده از گاما آلومینای عامل‌دار شده". مجله آب و فاضلاب, 27, 6, 1395, 33-41. زرین کمر, رقیه, غربانی, پروین. (1395). 'مطالعه جذب سطحی حذف رنگزای مالاخیت سبز با استفاده از گاما آلومینای عامل‌دار شده', مجله آب و فاضلاب, 27(6), pp. 33-41. زرین کمر, رقیه, غربانی, پروین. مطالعه جذب سطحی حذف رنگزای مالاخیت سبز با استفاده از گاما آلومینای عامل‌دار شده. مجله آب و فاضلاب, 1395; 27(6): 33-41. 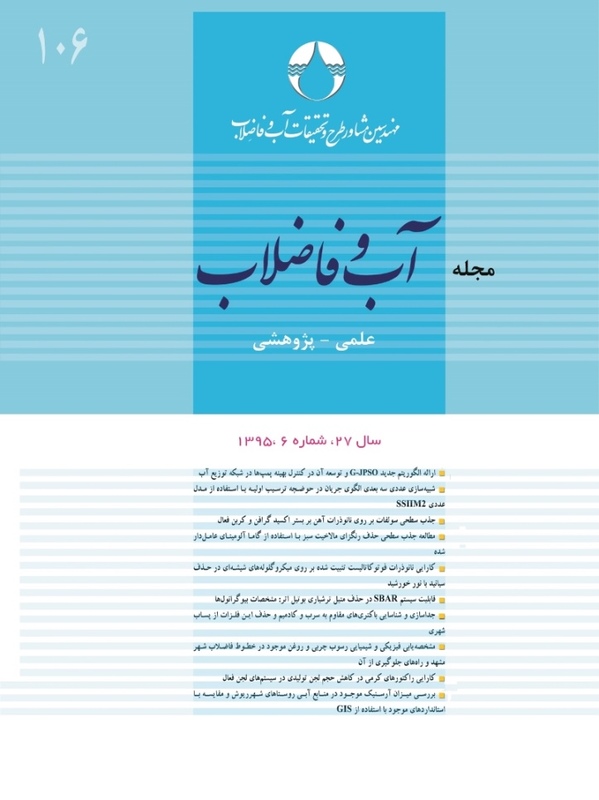 در این مقاله، گاما آلومینای عامل‌دار شده برای حذف رنگزای کاتیونی مالاخیت سبز از محلول‌های آبی به روش جذب سطحی مورد استفاده قرار گرفت. ابتدا خصوصیات ذرات عامل‌دار شده با FT-IR، SEM، XRD و EDAX شناسایی شد. سپس اثر پارامترهای مختلف از جمله غلظت اولیه رنگزا، زمان تماس، pH آغازین، دز جاذب و دما بر روی حذف رنگزای مالاخیت سبز مطالعه شد. pH نقطه صفر بار جاذب نیز تعیین شد. نتایج نشان داد که فرایند جذب سطحی در 60 دقیقه به تعادل می‌رسد و مقدار حذف رنگزا با افزایش دز جاذب و pH افزایش می‌یابد. مطابق نتایج 1/0 گرم از گاما آلومینای عامل‌دار شده قادر به حذف 69/91 درصد از رنگزای مالاخیت سبز در غلظت اولیه 50 میلی‌گرم در لیتر و در pH برابر 10 است. مطالعه ایزوترم و سینتیک جذب سطحی نشان داد که جذب سطحی رنگزای مالاخیت سبز بر روی گاما آلومینای عامل‌دار به خوبی از مدل ایزوترم تمکین و سینتیک شبه مرتبه دوم پیروی می‌کند. Modified γ-Alumina was used for the adsorption of the cationic dye malachite green (MG) from aqueous solutions. The properties of the modiﬁed particles were initially determined by FT-IR, XRD, SEM, and EDAX. The effects of such parameters as initial dye concentration, contact time, initial pH, adsorbent dose, and temperature on dye removal were investigated and the pHzpc of the adsorbent was determined. Results showed that equilibrium was achieved in 60 min and MG removal increased with increasing adsorbent dosage and pH. The experimental results indicated that 0.1g of modified γ-Alumina was capable of removing 91.61% of the MG dye from an initial concentration of 50 mg L-1 at pH=10. Results of isotherm and kinetic studies revealed that adsorption of Malachite Green dye onto modified γ-Alumina best fitted the Temkin isotherm and pseudo-second-order kinetic models. 2. Forgacs, E., Cserhati, T., and Oros, G. (2004). “Removal of synthetic dyes from wastewaters: A review.” Environ. Int., 30, 953-971. 3. Mittal, A., Gupta, V.K., Malviya, A., and Mittal, J. (2008). “Process development for the batch and bulk removal and recovery of a hazardous, water-soluble azo dye (Metanil Yellow) by adsorption over waste materials (Bottom Ash and De-Oiled Soya).” J. Hazard. Mater., 151, 821-832. 5. Makeswari, M., and Santhi, T. (2013). “Removal of malachite green dye from aqueous solutions on to microwave assisted zinc chloride chemical activated epicarp of ricinus communis.” J. Water Resource Prot. 5, 222-238. 6. Mittal, A., Thakur, V., Mittal, J., and Vardhan, H. (2014). “Process development for the removal of hazardous anionic azo dye Congo red from wastewater by using hen feather as potential adsorbent.” Desal. Wat. Treat., 52, 227-237. 7. Al-Degs Y.S., and Sweileh, J.A. (2012). “Simultaneous determination of ﬁve commercial cationic dyes in stream waters using diatomite solid-phase extractant and multivariate calibration.” Arabian J. Chem., 5, 219-224. 8. Robaina, N.F., Reis, L.G.T.D., and Cassella, R.J. (2011). “Diffuse reﬂectance determination of malachite green using polyurethane foam as solid support and sodium dode- cylsulfate as counter ion.” Talanta, 85, 749-753. 9. Farhadi, K., Maleki, R., Nezhad, N.M., and Samadi, N. (2010). “Spectrophotometric determination of malachite green residue in water samples after preconcentration on surfactant-coated alumina.” Spectrosc. Lett., 43, 101-107. 10. Shabudeen, P.S.S. (2011). “Study of the removal of malachite green from aqueous solution by using solid agricultural waste.” Res. J. Chem. Sci., 1, 88-104. 11. Ahmad, R., and Kumar, R. (2010). “Adsorption studies of hazardous malachite green onto treated ginger waste.” J. Environ. Manage., 91, 1032-1038. 12. Hameed, B. H. (2009). “Spent tea leaves: A non-conventional and low-cost adsorbent for removal of basic dye from aqueous solutions.” J. Hazard. Mater., 161, 753-759. 13. Mall, I. D., Srivastava, V.C., Agarwal N.K., and Mi- shra, I. M. (2005). “Adsorptive removal of malachite green dye from aqueous solution by bagasse fly ash and activated carbon-kinetic study and equilibrium isotherm analyses.” Colloid Surface A., 264,17-28. 14. Mohammadifar, E., Shemirani, F., and Majidi, B. (2015). “Application of modiﬁed nano-γ-alumina as an efﬁcient adsorbent for removing malachite green (MG) from aqueous solution desalination and water treatment.” 54, 758-768. 15. Hosseini, S.A., Niaei, A., and Salari, D. (2011). “Production of γ-Al2O3 from kaolin.” Open J. Phys. Chem., 1, 23-27. 16- Jian, Z., Yu, J., and Guo, Z.X. (2005). “Preparation of functionalized core-shell alumina/polystyrene composite nanoparticles.” Macromol. Chem. Phys., 206, 1558-1567. 17- Busca, G., Lorenzelli, V., Ramis, G., and Willey, R.J. (1993). “Surface sites on spinel-type and corundum-type metal oxide powders.” Langmuir, 9, 1492-1499. 18. Karim, M. R., Rahman, M.A., Miah, M. A. J., Ahmad, H., Yanagisawa, M., and Ito, M. (2011). “Synthesis of -alumina particles and surface characterization.” Coll. Sci. J., 4, 32-36. 19. Araujo, P.Z., Morando, P.J., and Blesa, M.A. (2005). “Interaction of catechol and gallic acid with titanium dioxide in aqueous suspensions. 1. Equilibrium studies.” Langmuir, 21, 3470-3744. 20. Ziegler, I.M., and Billes, F. (2002). “Vibrational spectroscopic calculations on pyrogallol and gallic acid.” J. Mol. Struc.-Theochem., 618, 259-265. 22. Connor, P. A., Dobson, K. D., and McQuillan, A. J. (1995). “Infrared spectroscopy of the TiO2/aqueous solution interface.” Langmuir, 11, 4193-4195. J. Am. Ceram., Soc., 83, 2324-2326. 25. Macêdo, M.I.F., Osawa, C.C., and Bertran, C.A. (2004). “Sol-gel synthesisof transparent alumina gel and pure gamma alumina by urea hydrolysis of alumina nitrate.” J. Sol-gel Sci. Tech., 30,135-140. 27. Zhang, S., Chen, H., and Rasmuson, C. (2013). “Thermodynamics and crystallization of the theophylline– salicylic acid cocrystal.” Cryst. Growth Des., 13, 1153-1161. 28. Hameed, B. (2009). “Spent tea leaves: A new non-conventional and low-cost adsorbent for removal of basic dye from aqueous solutions.” J. Hazard. Mater., 161, 753-759. 29. Asfaram, A., and Fathi, M. R. (2013). “Removal of direct red 12B dye from aqueous solutions by wheat straw: Isotherms, kinetics and thermodynamic studies.” J. Color Sci. Tech., 7, 223-235. 30. Abdel Salam, M., and Burk, R.C. (2010). “Thermodynamics and kinetics studies of pentachlorophenol adsorption from aqueous solutions by multi-walled carbon nanotubes.” Water Air Soil Pollut., 210, 101-111.